You Could be Liable, so Why Risk It? The lead leaching problem in America is more complex and widespread than most general news organizations would make you think. Lead pipes are found worldwide, as well as throughout the United States, especially in some of our oldest cities. Thousands of years ago, lead became a choice material for water pipes, because it's found in many regions, it's malleable and it's extremely durable. Now, many countries are left with lead supply pipes that release dangerous amounts of lead into the water. When consumed, lead can cause serious adverse health effects, especially for children, and can even be fatal. The American Water Association estimated in 2016 that there are 6.5 million lead service pipes still in use in the United States, which are found running from the city water main to homes and buildings. 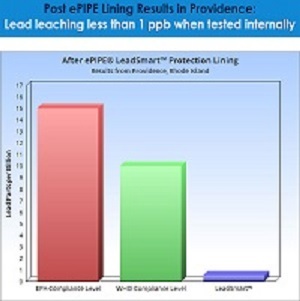 However, it's very important to stress that lead leaching does not only occur solely as a result of lead pipes – a water supply system may also contain several types of lead contributors, all which can release toxic levels of lead. This information is key. In other words, you are incorrect if you have been thinking: My hotel's pipes are copper or galvanized steel, so my hotel is safe from dangerous lead levels. The problem does not start and end with the underground service pipes bringing water to your property. Lead contributors include lead solder (copper pipes often have lead solder), galvanized steel pipes and copper alloy fittings like brass fittings. Lead solder was commonly used until about 1986, favored by plumbers for its ease of application. Galvanized pipes are known to attract lead particulates. Brass fittings until recently contained high lead content in their make-up. Lead service lines (LSLs) are often found delivering water to buildings completed before 1950, galvanized steel pipes were commonly included in buildings constructed before the 1960s and copper pipes were commonly installed in buildings between the 1960s and 1990s. Still, no matter when your hotel was built, it's important to find out exactly what types of water supply pipes lay within it, as well as what type and the extent of the use of lead contributors are found in the water supply systems. Lead is released into drinking water through corrosion. When water interacts with lead or lead contributors, it causes a chemical reaction that dissolves the metal and releases lead. Water with high acidity or low levels of minerals is particularly known to accelerate lead leaching.